Fixtures are designed for either resistive spot welding (RSW) or arc welding (MIG) used with turn-key robotics systems. 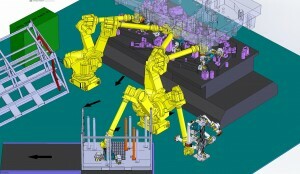 Operator ergonomics, robot reach and cycle time studies are verified through cell modelling and robotic simulations to maximize productivity. Nests are designed to be fully adjustable. Spatter protection is used for sensors, cylinders and sensitive areas. Robotics cells are modeled to simulate processes, verify robot reach, improve productivity and optimize the floor space while ensuring operator ergonomics and safety. 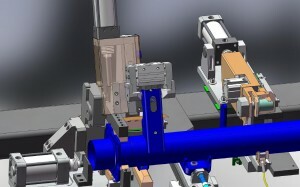 Robotics simulations are used to predict and improve cycle time.